While Japan has always had a high number of cyclists the number has been growing even more rapidly as many people not only use the bicycle as a tool, but are also beginning to take up cycling for recreation and health reasons. In addition to this after the transport disruption caused by the March 2011 earthquake many more Japanese have taken up commuting to work. As a result increasing number of cyclists, and changing use of the bicycle in Japan, the number of accidents involving bicycles has increased, and it has become painfully obvious that the general public have very little awareness of Japan's cycling laws. This prompted Insweb Research to conduct a survey of 1443 people (1072 mane, 371 female) asking them questions about Japanese cycling laws. Upon completion of the survey they produce this most enlightening infographic. 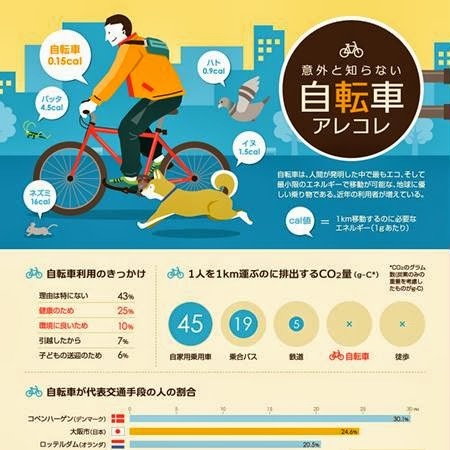 A huge 72% of those surveyed were unaware that it is illegal to operate a bicycle one handed and that it can result in a ¥50,000 fine or 3 months imprisonment. 44% of those surveyed had no knowledge that children are required by law to wear helmets when cycling. 49% were unaware of the requirement to use a headlight when cycling at night. 62% believed that stop signs do not apply to cyclists. While the general public's lack of awareness of the rules in a problem, as I always state in this blog, the real problem is the rules are not being enforced, and until the police do their jobs and enforce the laws they will go largely ignored endangering the lives of millions of Japanese cyclists each day. Additionally now the results of the survey are in, what is going to be done about the problem? * This has been a rushed post, I'll translate the results of the survey more thoroughly as I find the time, so please remember to come back. US$500 fine for riding with one hand? No wonder the police don't enforce that rule. The punishment is extreme and ridiculous, and the cops know it! Indeed that rule is extreme, but it is basically a catch all rule that covers cycling while holding an umbrella or using your mobile phone etc. Now consider this: A police officer in Japan can fine you US$500 or punish you with three months jail for "riding dangerously" where riding dangerously is defined as basically whatever the police officer considers dangerous. Again this is another catch all law. After posting this infographic I cycled to work. On the way I almost collided with a fellow cycling on the wrong side of the road while wearing headphones and taking a swig from his can of beer. That's four violations right there! Japan has no cycling laws, just suggestions! It is amazing that Japanese people use the bicycle so much, specially in Tokyo... given that the whole city has not a single stretch of lane devoted specifically to them. Then again, yes, cyclists should be careful, aware of obvious safety rules and polite when riding (specially towards pedestrians and other cyclists) but disobeying the laws of an authority that basically does nothing to protect you but puts all the burden on yourself following rules is a right of citizens. It has always been the only "weapons of the weak" as J.C. Scott puts it. I have only had an accident on a bicycle in my life, a car crashed me (softly) onto the ground when I was crossing a traffic light ("blue" for me) and it didn't see me when tuning into my road. And I have cycled in seriously dangerous and crazy cities (Madrid, Santo Domingo, Bangkok). Japanese cyclists should take to the roads, break the rules and be as damn annoying as they can towards the traffic while staying out of the sidewalks where poor pedestrians should be safe from vehicles. "the whole city has not a single stretch of lane devoted specifically to them"
Tokyo is not a city. There are cycle lanes. Few of them, maybe should be more. But saying none is a lie. Are they really necessary? Or only for places where drivers don't respect cyclists. In Amsterdam, the cycle lane is hell! Cyclists are arrogant and do not respect pedestrians and cars. To the hell with cycle lanes like that! I feel safer walking among the cars in Tokyo than crossing a cycle lane in Amsterdam. As the author pointed here, people must learn the rules before. Today, I crashed into another cyclist because he was crossing a red light. No harms, but it could be avoided. Could you post a link to the original infographics ? Not only do the police not enforce the law, at least proactively instead of reactively, I have seen them violating it on occasion themselves, including one young cop riding with a completely flat tire, wobbling all over the place. Then again, Japanese police are not very proactive outside of Roppongi as far as I have seen. @On Top of the Wall: Tokyo does have some cycling lanes. Unfortunately, most cyclists, including some cops, pay little attention to the direction of travel, staying out of pedestrian lanes, stop sign, traffic signals or anything else. Japanese cyclists should be more annoying to traffic? Can they be more than many already are? Ignoring traffic rules, blowing stop signs, salmoning? Already doing that. I have gotten more complaints from Japanese friends who know I love cycling about the increasing dangers of cyclist in the last 2-3 years than I ever had before. Many are very angry and want stricter cycling laws. Those stricter laws will be made by the old geezers who make all the other useless laws. We will get more construction, though. 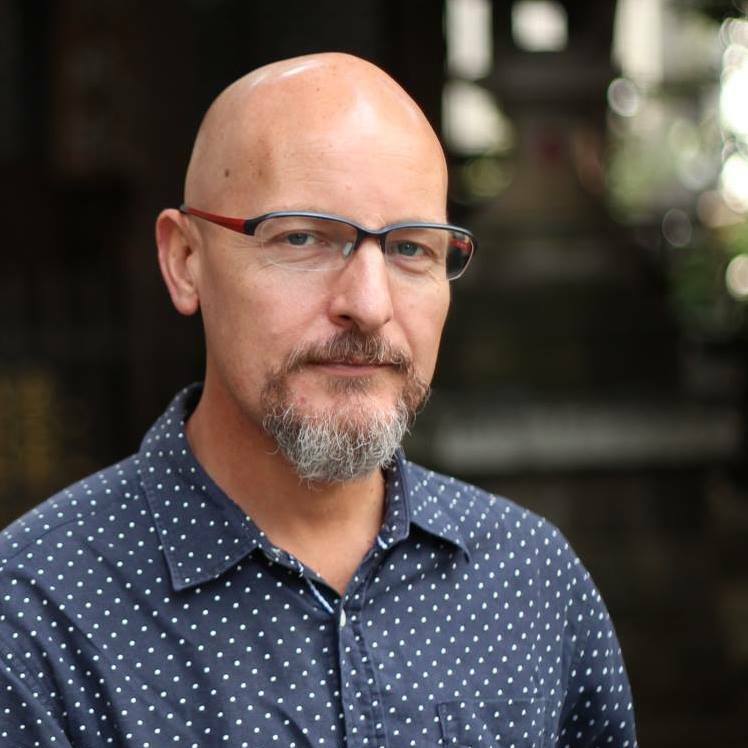 I meant to write above: Ride 20-30 miles daily..
@Puddintain "I have gotten more complaints from Japanese friends who know I love cycling about the increasing dangers of cyclist in the last 2-3 years than I ever had before." That is my experience as well. Some people are actually quite visceral about their disdain for cyclists. I actually cycle much less these days, not because of taxis, but because of crazy cyclists. So I understand there angst. I guess much of it has to do where one lives in Tokyo. Inside and around the Yamanote line, it is really a mess. Rarely a day goes by that I am not brushed, hit, or snagged by a rogue cyclist on my way to the station. I suspect the increase in high rise apartments is part of the problem. In areas like Tsukishima or Senjyu for example, it used to be low rise homes but now 30/40 floor towers are springing up like mushrooms. That is a lot of additional bicycles. Also, about 10 years ago, Tokyo began enforcing parking laws on the takyubin delivery trucks -due to motorist complaints. As a result the delivery companies built satellite shops that make deliveries by bicycle truck. They have made life much more congested in my area. Those delivery bicycles are way to wide to be ridden on the sidewalk, even shared use sidewalks, yet the police do nothing to stop the practice. The sooner the roads are made safer for cyclists, and cyclists and pedestrians no longer have to mix the better, but until the roads are safe for all people will continue to cycle the sidewalks of Japan. I think the roads are very safe here. Rarely do I see pot holes, drivers are exceptionally safety conscious, at least compared to other cities around the world I have cycled. To be brutality frank, the biggest safety problem is other cyclists. "The Salmons" as they are called- are the worst. 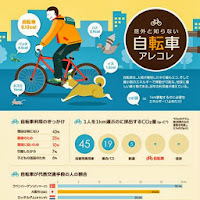 Cyclists in Tokyo, like cyclists anywhere in the world, prefer cycling on the walking path because it is safer. Rather than get bullied by cars, they can bully pedestrians- and they do. In London or New York, this would get one a fine if the cyclist would be lucky enough not to be throttled by pedestrians before being ticketed. Cyclists in Tokyo are fortunate pedestrians are so passive. Cycling is dangerous by nature. I enjoy cycling, but believe it is arrogant and outrageous to endanger pedestrians for the sake of my pleasure. If one does not like the risk profile- don't do it- but do not endanger others. That is just plain selfish. I appreciate it was a rushed post but perhaps you could correct one oversight? it was the March 2011 earthquake (not 2013). Cheers! I came here hoping to find any indexes or numbered bullets of laws. I think i just have to wait to get to tokyo and watch carefully before buying a bike.